Winner of the 2002 Oscar for Best Short Documentary, this resembles any other feature-length documentary, going to show that the short documentary resembles the short film, just as how the feature-length documentary resembles the feature-length fictional film. How? Because documentaries, while dealing with non-fictional material, are still dramas first and foremost. They present and build characters, they display conflict, they connect audiences emotionally. The film follows two brothers who each served for the NYPD and NYFD. The set-up of these brothers and their family takes its time, providing in depth insight to the everyday duties for over half of the film: Family tradition, honor, heroism, duty. Despite its title, the major conflict of the World Trade Center is only presented past the halfway mark. 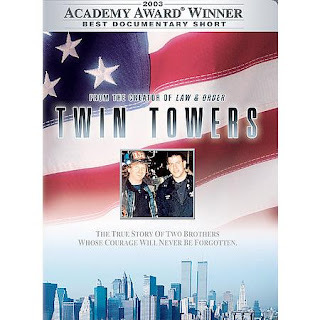 On September 11, 2001, which coincided with the filming of this documentary. Exposition, rising action, climax, conclusion. We are provided three-acts, condensed into 34 minutes. Is it a fitting length? Yes. The story is brief. But it still means the requisites of a dramatic story. It could almost be argued that this doesn't even resemble a short, but a feature-length, in structure. In class, both students and professor have difficulty pinpointing just what defines a short documentary. Yet one has to note that a documentary isn't much different from a fictional film, especially structurally. Each are designed to elicit emotion, even if it is using interview and archival footage. Short documentaries are just a sub-label for short films; to make the distinction of fiction versus nonfiction, nothing more. It is interesting that this documentary is structured in the style of a fiction film, as you put it, "exposition, rising action, climax, conclusion". Many documentaries are not made this way and I wonder if that is why it won the Academy Award for Best Documentary Short, because it is real life set to an action drama film, and not the other way around.